Catching kingfish from the surf is a summertime tradition along the Virginia Coast. 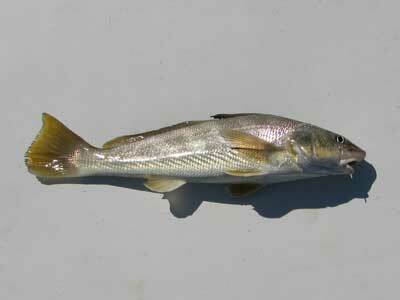 Also known as whiting or roundheads, these fish can be caught in good numbers with basic surf fishing equipment. The common names “kingfish”, “roundheads”, and “whiting” are collective terms for two distinct species. The northern kingfish has a contrasting pattern dark and silver bars. The southern kingfish is silvery with more uniform coloration. Although often misunderstood, kingfish can be extremely fun to catch from the surf. They are often overlooked by distance casters, as they tend to feed right behind the breakers. To catch kingfish successfully, all that is usually needed is a light to medium duty surf outfit, simple top and bottom rigs, small hooks, and a supply of bait. Kingfish will accept a wide variety of baits, although (small) size usually matters. Popular baits for catching kingfish include squid, bloodworms, shrimp, peeler crab, and mole crabs. As with other bottom feeders, kingfish prefer soft-shelled mole crabs. During the summer fishing season, soft-shelled mole crabs can sometimes be harvested right in the wash while fishing. When kingfish bite, anglers often feel a series of taps. If the line is allowed to go slack when a fish bites, it often escapes. When a fish gets hooked, it usually makes a hard run and puts up a good fight to the wash.
One of the advantages of fishing for kingfish is the variety of fish species that are caught together. The same techniques that produce good catches of kingfish also work well for spot, croaker, seatrout, flounder, small bluefish, pompano, puppy drum, and other saltwater species. Although kingfish are sometimes shunned as table fare because of their small size, they are delicious. A good day’s catch can provide a meal for the entire family while releasing a few fish for the future.